Wine and Alchemy is an unique world music band, performing original and traditional music derived from a wide variety of times and cultures including: Greek, Gypsy, Celtic, Medieval European, French, Sephardic, Turkish, Classic Rock and others. 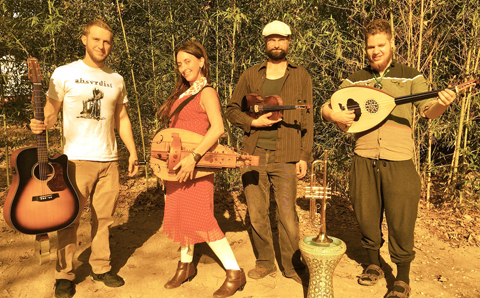 In addition to vocals in a myriad of languages, violin, accordion, and guitar, the band features a variety of exotic instruments including hurdy gurdy, turkish saz or greek bouzouki, harmonium, viola da gamba, tupan and a hand drum kit comprised of doumbek, djembe, kick tupan, and cymbals. 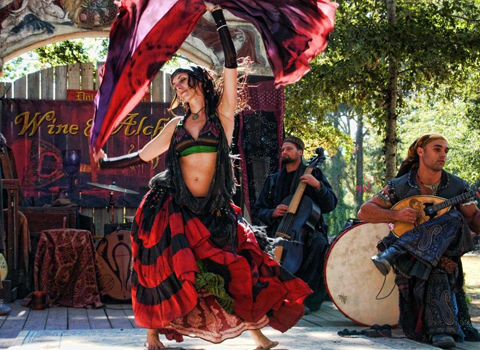 Singer, composer, director, and harmonium and hurdy gurdy player, Roxanne Bruscha, adds to the visual of Wine and Alchemy’s live show with a unique World Fusion Belly Dance performance featuring veil spinning and sword balancing. Roxanne is Wine and Alchemy’s Director, Stage Producer, Co-composer, Lyricist, Singer, Dancer and Harmonium and Hurdy Gurdy Player. Roxanne’s love of music started at a very young age with an early fascination with the piano and a strong desire to sing in the church choir. Since her childhood, her musical interests have evolved in such a way as to help bring you the fusion style you can hear in Wine and Alchemy. Entertaining audiences throughout the United States as a premiere World Fusion Belly Dancer, Vocalist, and Musician for over a decade, Roxanne dedicated her efforts to the Wine and Alchemy project in December 2007. Branching out into her solo project, the music created by both Roxanne and Wine and Alchemy is influenced by many World Music genres. 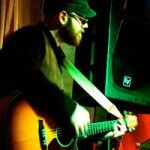 Since 2008, Jake has been playing with Wine and Alchemy as the band’s lead percussionist and now guitarist as well. Native to San Antonio, Texas, Jake comes from a musical family. With an accomplished bass player and Greek music enthusiast for a father and an older brother as a skilled metal drummer, Jake has been drawn to music all his life. First learning bass guitar and drum kit, Jake has branched out into world music percussion as Wine and Alchemy’s drummer. Jake plays a specially designed hand-drum kit consisting of a range of doumbeks and djembes as well as a custom made bass drum and foot tambourine. Hailing from the exotic land of Long Island, David started playing music at a young age, beginning with the bass guitar then broadening and diversifying his horizons through Renaissance fairs and trips overseas. 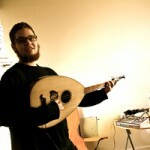 At the age of eleven he picked up the Saz and Darbouka and has been playing them ever since. David also plays the 7 string Lavta (a smaller but longer fretted oud) as well as frame drum and the Sitar. Along with Middle Eastern music, David produces hip hop and plays bass in a rock band. His influences span many different cultures and genres. Alex has been involved with Wine and Alchemy since 2009, performing with viola da gamba, violin, greek bouzouki, mandolin and other instruments as well as playing a strong roll in studio recording and song arrangements. A talented multi-instrumentalist, Alex has been a student of early music from a young age. He began his studies under his father Alex Raykov, and has since graduated from Indiana University with a degree in early music performance, having studied viola da gamba and renaissance lute. 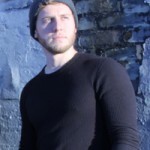 Alex has performed around the United States and Canada with a number of ensembles and as a soloist at events such as the Bloomington Early Music Festival and the Boston Early Music Festival. 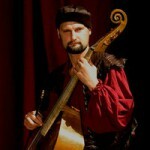 He ifrequently plays with Cantiga, an early music ensemble that he has known for most of his life. 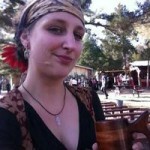 Kat has been playing guitar and singing for many years as the front person for Lunar Carnival. Bringing her extraordinary vocal harmonies into play as well as her skills as a guitarist, Kat began working with Wine and Alchemy at the beginning of 2015. Vid has been a key producer for Wine and Alchemy’s last 2 studio albums – Bacchanalia and Karavanna Boheme – and plays both bass and guitar with the band. A sound engineer by trade (and audio Dragon Master), Vid also sings, composes and plays guitar for Ghosts and Bones, has done a year as a sound engineer for the Massachusetts Museum of Contemporary Art and (not to mention) has fixed my broken audio equipment/car/trailer more than once. I saw Wine and Alchemy for the first time at Mid Michigan Renaissance Festival in Vassar MI and I have to say, they were amazing. I felt as though I was in a different country while sitting and listening to her. Not only entertaining but a delight for the eyes and great photo opps! Thank you Roxanne for giving us some knowledge on your instruments too! It was very interesting. Quite Mezmerizing! Loved it, Hope you can come back to our faire again next year! From a blue collar construction worker of 56 years of age to a more enlighten person through this music wow makes me what to dance around good stuff.